Getting your little one up and moving is definitely an important step, but it can be difficult finding the right toys and gadgets to help them along the way. The best baby walker for sale is the one that encourages your little one to move on their own and makes it a whole lot of fun. 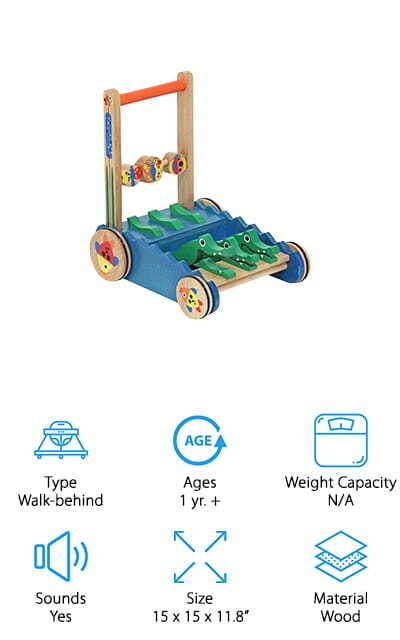 Our baby walker buying guide focuses on some fun and creative walkers that will definitely keep your little one happy. Type: What style of walker is it exactly? Is it one that your little one sits in? Are they going to walk behind it? You want to know exactly what is going to happen and how it’s going to work for your family. Ages: How young can your baby start using the walker? How old should they stop using it? You’ll want to know where your child is going to get the most use and versatility out of this new toy and when they might need something else. Weight Capacity: How large of a child is it able to hold? Will your little one fit comfortable or be able to support themselves fully? Do you need to look for something else to get your little one comfortable walking? Sounds: Does it make sounds of its own? This can be really fun for your little one while they’re walking around or playing with the toy. Different sounds make it a whole lot more fun to explore and experiment with the walker. Size: Just how much space is it going to take up? Is your little one going to be able to get around the house decently or around a good size space even with the walker? Do you need something small or will a larger one do? Material: Just what is the walker made out of? This is going to play a part in the overall durability and you may prefer one type of material to another. It’s going to be up to you which walker your baby uses each day. With so many items for infants out there it’s nearly impossible to find something that works and doesn’t cost a fortune. We’ve gone through the lists of everything we can and found 10 great options that are going to make you and your little one really happy. Each of these baby walker reviews will help you narrow the list further and find the perfect option for your entire household. 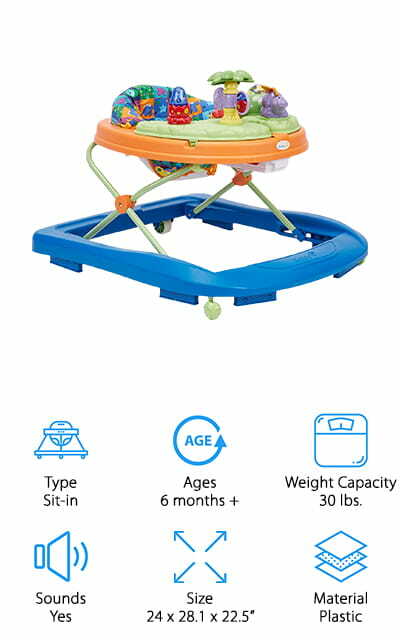 Our top pick is one of the best rated baby walkers and actually a 3-in-1 activity center that gives your little one plenty to do and explore while they’re learning to walk. All you have to do is stand them up in the seat (or they can sit if they prefer) and they’ll be able to walk all the way around the circle, playing with several different toys and gadgets that make it all even more fun. 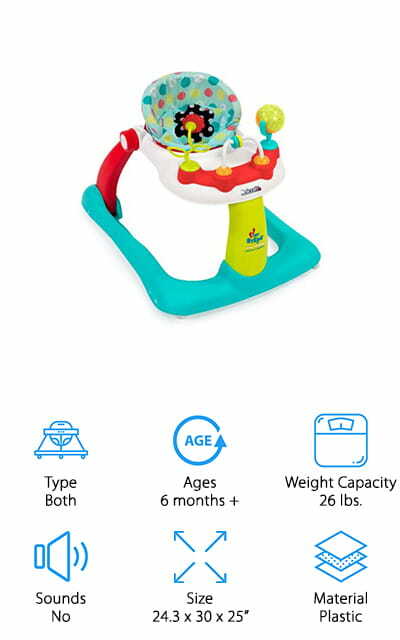 Designed for children 6 months and up or up to 25 pounds, this station rotates all the way around and has over 15 different activities for your little one to enjoy. Completely lead free and BPA free, this table is safe and non-toxic as well as helping your baby learn some new skills. Made with a durable plastic you won’t have a problem keeping it clean or keeping it ready for your next little one to enjoy either. Adjust the height settings easily and enjoy the lights and sounds and these cool baby walkers are going to be great for your little one. This super cute monster just wants to play and your little one will too, with these best cheap baby walkers. 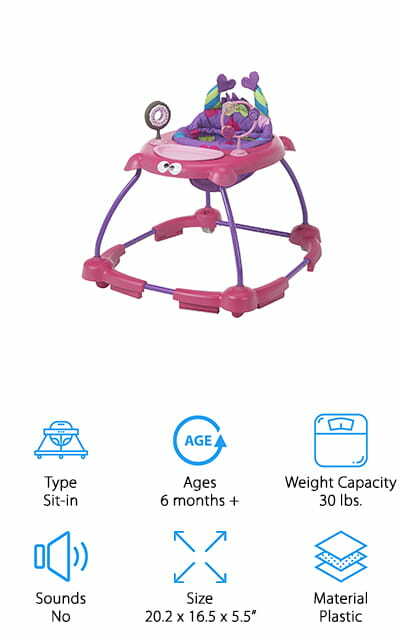 You get to choose between one of two cute monsters for this sit-in walker that allows your baby to sit comfortably and learn how to move on their own. 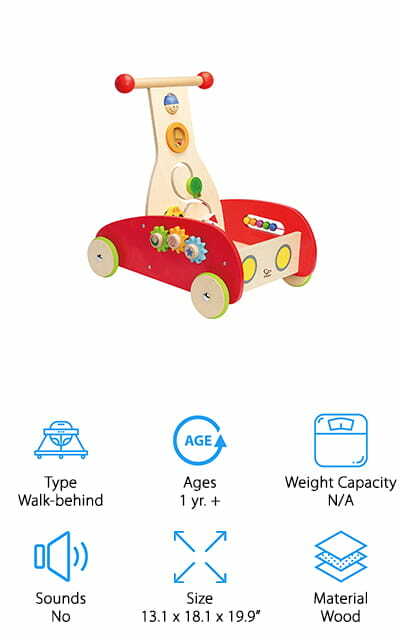 It has a stable base with wheels and balance to keep them moving forward safely and it’s got plenty of features. It has toys attached for them to play with and even a small tray for snacks that’s dishwasher safe. If anything gets on the seat pad that’s also machine washable and dryable. With two different height adjustments and safe for little ones up to 30 pounds, this walker doesn’t even require tools to get it set up and ready to go. It’s lightweight and easy to take with you anywhere you want to go. 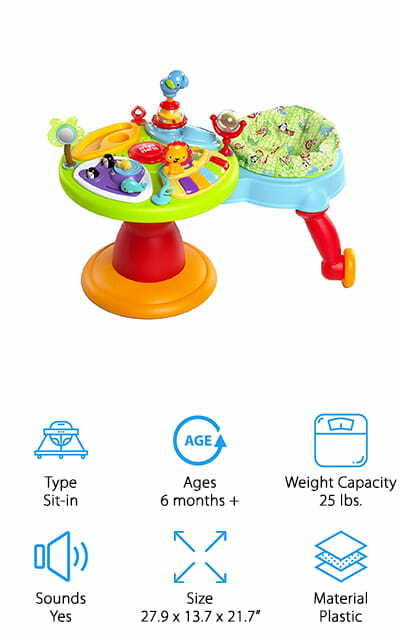 On top of all that, the bright colors and fun design are going to make your baby plenty happy to sit and play here. Even better, it works on carpeting, making it the best baby walker for carpet. Who hasn’t seen the classic little red wagon before and loved it as a child? Well, this best wooden baby walker is going to be a super fun option for your little one because it’s actually a walk-behind option. Your little one will be able to put their favorite toys in the front and walk behind the wagon, holding onto the solid bar at the top. The wagon itself is made of solid wood for a sleek and stylish look and has a bumper at the front to help protect your furniture and other parts of your home, making it the best baby walker for hardwood floors as well. Designed for children from 1 – 4 years, it provides just the right amount of resistance to help them develop confidence. You’ll even be able to keep playing with it after your baby learns how to walk on their own because it’s the perfect way for them to take anything they want around the house. The sides are removable for added versatility as well. This super-fun walk-behind toy is definitely going to make your little one laugh as the best baby push walker. With the wood frame and full-color design, it’s definitely a great option. It features bugs, fish, alligators, butterflies and a whole lot more. While it’s being pushed it makes noise that will keep them going and there’s plenty to play with at the same time. Designed for children 1 year and up, it’s sturdy enough to help them get their confidence and move easily. They’ll learn more motor skills and parents will appreciate that this lightweight toy is super easy to put together. This handcrafted piece is made with hardwood and nontoxic dyes and paints so you can feel comfortable giving it to your little one. It even has non-skid wheels to let it move forward and back and a comfortable handlebar just the right size for your baby to hold onto. 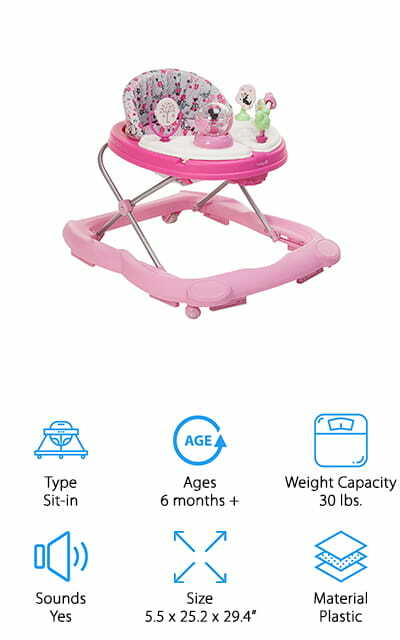 With these top baby walkers, you get a walk-behind or a push toy that your child can even sit down and play with as well. It’s moderately priced and has plenty of fun colors and images to keep them interested with the all-wood construction. Gears and knobs that move and swivel help your baby to develop more coordination and even fine motor skills while they play and you can feel safe giving it to them. The wood is sustainably sourced from forests and everything has a non-toxic finish and child safe materials. Rubber rimmed wheels keep all of your belongings safer and the fact that it can pull their favorite toys along makes it even better for your little one. It’s easy to assemble and the perfect height to let your baby push or pull it along with no problem, whether they’re comfortable walking or just getting started. Your little one will definitely be feeling more adventurous and playful when you sit them in these fun more expensive baby walkers. It has plenty of balance and strength to support them comfortably and still provides them with the movement they need to start enhancing their own walking. The nautical theme to the toys that are fixed to the walker will make it even more fun to just sit still or to walk around. There’s even a steering wheel that gives lights and ocean sounds. They’ll even be able to take some of their favorite toys along with them while they’re heading out all over the house. The high back for the seat provides added support and there are adjustments underneath that make sure it fits just right for your little one, plus the height is adjustable to accommodate their growth. Lightweight and designed to enhance motor skill development, it also encourages movement play and is simple to take with you on the go. This super fun toy is great for your smaller children or for your toddler because it grows with them. When they’re little it’s a sit-in walker that lets them play with their toys from a comfortable space, but when they’re a little bigger it can be transformed into a walk-behind system that still gives them the toys but even more support. The height can be adjusted to help your baby throughout their growth and the friction pads on the base help to keep it from skidding. Your little one will learn a range of different developmental skills from each of these toys and when you’re ready to put it away you can fold it flat. That makes storage or taking it anywhere you want to go a whole lot easier. If it gets dirty just wipe it down and throw the seat cover into the washing machine. It will be clean and ready to go in no time. 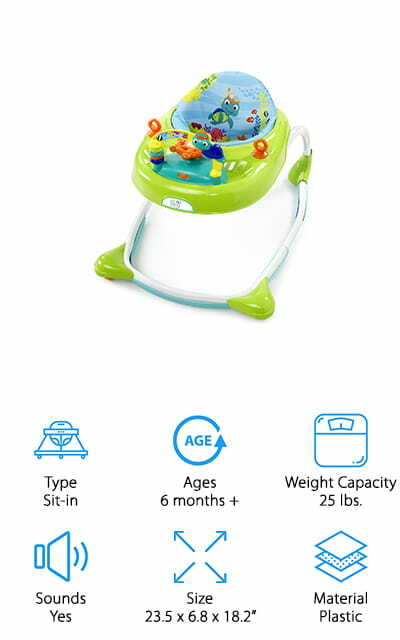 It’s one of the best baby activity walker options. 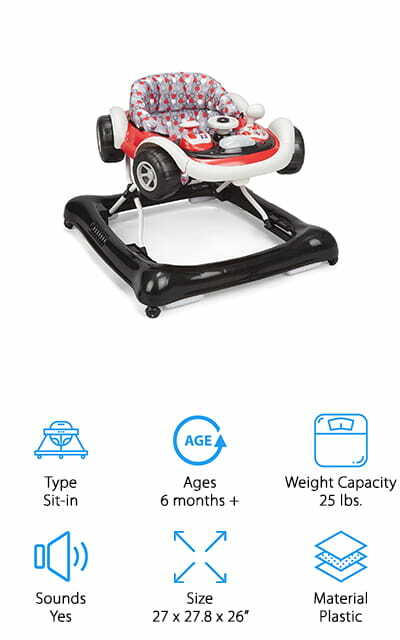 With this Minnie Mouse walker, your little one is going to be having a great time. It has full support all the way around and plenty of toys attached for them to play with. It’s also fully secure at the base with a solid metal frame and wheels to make it easy to move. The activity trays can slide open to reveal a snack tray or a space for their favorite toy. You can adjust the seat height to one of 3 different options and you’ll be able to roll it around on just about any surfaces. When you’re ready to go anywhere you can fold it down and put it in your vehicle with no problem and then pull it back out again when you arrive. Suitable for children up to 30 pounds, it offers just the right amount of stability while still giving your little one free rein to wander around and get their legs under them a bit more. It’s the best walker for baby learning to walk. Our final option is a super fun car, super unique baby walkers, that your little one is definitely going to love taking for a spin around the house. The bright colors of red and black definitely stand out and give it a sleek look and the 3 position height means that it can grow with your child. The electronic tray has interactive lights and sounds and when you’re ready to travel you’ll have no problem folding it down. All you’re going to need is a couple batteries and this system is going to be all ready to go. The toy tray at the front keeps your little one entertained but when it’s time to have a snack it’s easy to remove so there’s a small tray for food. It meets all ASTM, CPSC and JPMA standards and certifications for safety and comes from a company you know and trust in children’s gear. It’s the best walker for tall baby or toddlers. With this sit-in walker, your baby is going to have plenty to do and play with because it comes with a range of different toys attached and even a tray for you to add their favorite toys or set up snack time while they play. With a comfortable and machine washable seat the walker itself has a range of lights and sounds and even dinosaur theme toys that help to increase fine motor control. Three different height adjustments make it easy to continue using as your little one gets bigger and it even folds down for storage and transport. Lightweight and super fun, this is a toy your baby is going to enjoy for as long as they can. The plastic frame is easy to wash and the seat itself is designed to support up to 30 pounds with plenty of balance and durability to keep your baby safe. 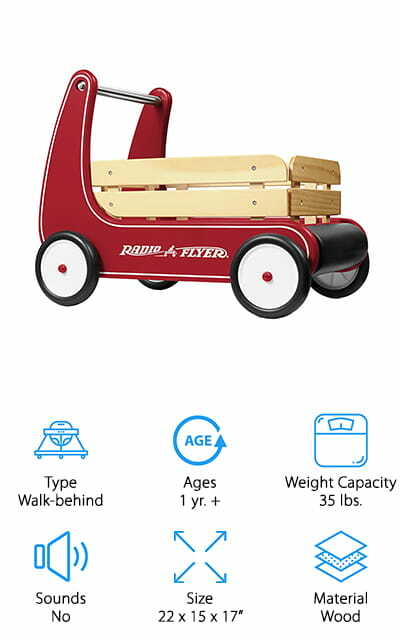 It’s also one of the top rated baby walkers out there.